When my fortieth birthday rolled around, I found myself waxing nostalgic about, well, pretty much everything. I began to look for things that comforted me as much as my warm memories do and what I keep coming back to more than anything when I feel the need to be comforted is food. Making it, enjoying it with family and friends, it truly is my favorite thing. And it's no secret I search for it every chance I get when I travel. Last week my travels led me to a very comforting part of the country: the South. Naturally I jumped on Eater.com (it's where I go to first when I'm researching the cuisine of a specific area) to check out what might be of interest at various stops along the way. My first stop is always Amarillo - it is the perfect driving day (about 10.5 hours) but as far as a food mecca ... well, it just isn't. I have found a few good places that'll "do in the dark" but I'm honestly waiting with bated breath for someone clever to take a chance on Amarillo. I think it could happen (more reasons why I think it could happen below as well as in upcoming travel posts). But there is not much in the way of comfortable accommodations a few hours before or after Amarillo, so I end up staying there on night one. My final destination was Birmingham, AL which I technically could have made in two days, but those would have been long days, and again, I'm all about staying somewhere comfortable when I travel, so night two I drifted quietly into Little Rock, AR. Now I'm not sure who decides what makes a state southern. I went to college in Missouri and while I considered that the South (because they had funny accents), they considered themselves mid-Westerners. Arkansas is directly below Missouri and directly above Louisiana (which I know is considered part of the South), so I'm saying it's Southern, alright? Alright, alright, alright, alright (to quote Matthew McConaughey, who is definitely Southern. I have a love-hate relationship with southern cuisine. I love the comfort factor - simple ingredients cooked well and sourced directly from the heartland. I hate the health-factor - some Southern cooking can focus a lot on fried foods and more meat n' taters than fresh veg. When I read about Little Rock's South on Main, I hoped I'd cash in on the comfort factor but avoid the pitfalls of way too much heavy food. 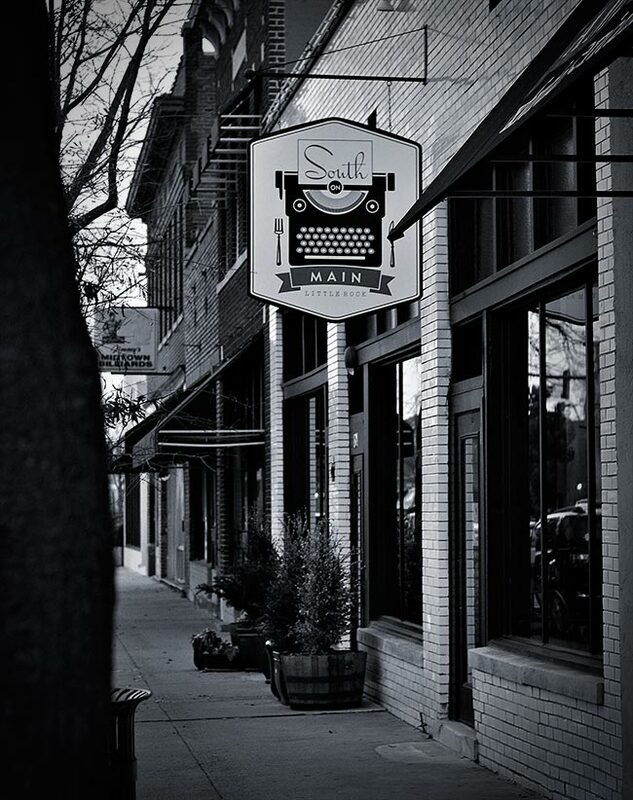 South on Main focuses on southern cuisine, but in a modern, yet approachable setting. The food is creative yet unpretentious. You're not eating anything unrecognizable, but you're encouraged to embrace a traditional dish with a unique spin on it. In addition to the restaurant, the location is a venue for promoting programming related to the Oxford American magazine. On any given night you might enjoy a jazz band or a reading from a local poet. The goal is to provide a complete culinary, artistic and educational "immersion" into Southern culture. I was aaaaaallllll over it. I enjoyed a Damson Plum Sour cocktail while the jazz band warmed up, and waited for my starter of Pork Cheeks with gnocchi, Parmesan and a slow egg to arrive. This was my first pork cheek experience. 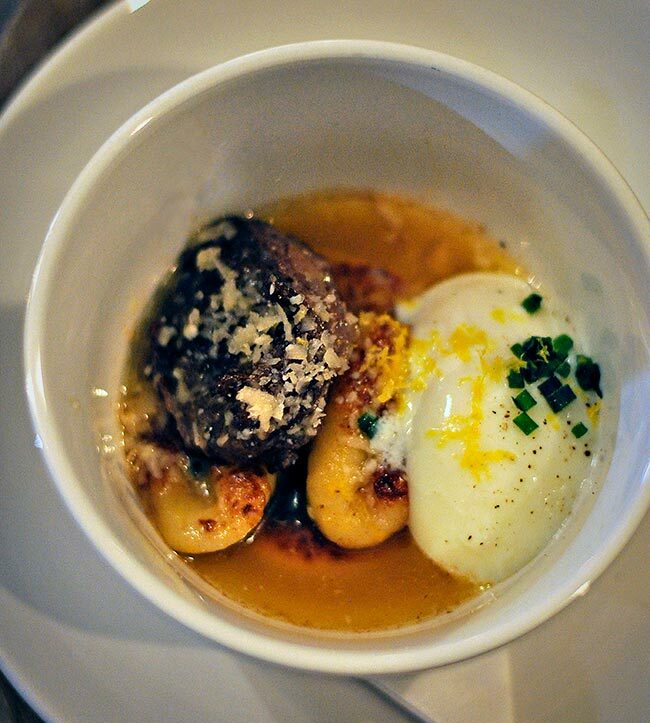 Just when you think pig can't get any better (slow-roasted shoulder, braised pork belly, etc.) they pull a fast one on you. What? You didn't know about the pork cheeks? Well, they're delightful. This was a seriously deep dish; meaty pork cheeks, pillowy soft gnocchi dusted with salty Parmesan and then that slow egg yolk mixing into everything and coating it in golden goodness. This was comfort overload but it wasn't overwhelming. We're talking maybe two ounces of pork, three lovely gnocchi and an egg. It was about six mouthfuls of Southern hospitality and my pants still fit just fine. South on Main is offering traditional Southern staples like roast chicken, duck, catfish and even a gulf boil (all with their own unique twist) but I went a little left of norm and settled on the Rabbit Boudin. I believe God gave us boudin because he wants us to be happy. 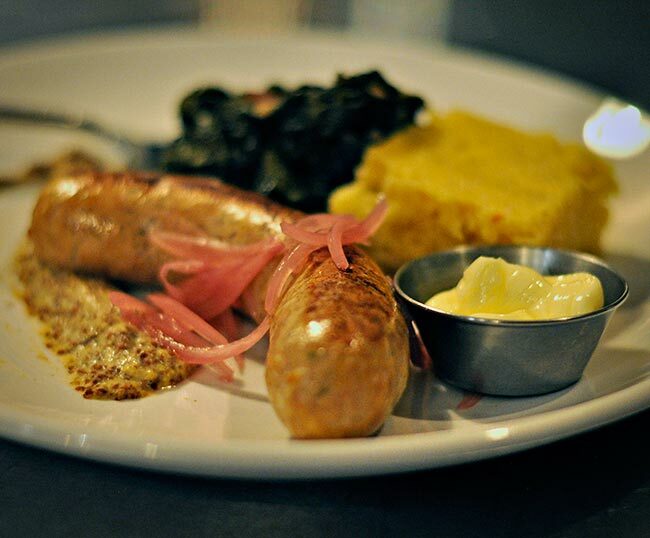 With it's origins in Louisiana and made up most often of various pork meats, it's hard to beat a traditional boudin. I wondered if the rabbit could take on such a delicious challenger. Well, I'll be honest. It was not what I was used to, but I enjoyed it for what it was. The tender, moist dark meat of the rabbit was earthy and interesting but I'll admit I missed the porkiness of a traditional boudin. No way was I complaining or sharing, though. It came with a side of greens so meltingly tender and a hunk of tender cornbread flecked with pimento, I didn't care how far north or south I was from the Mason-Dixon line. This was Southern cooking at it's finest ... and I still had room for dessert! Here's why I think places like this should be popping up all over: people really want to eat better. They want to eat healthier, they want to learn why good food matters, they just need something familiar attached to it to make the embracing of it all easier. South on Main is doing it, and a couple more places I ran into on my travels are doing it, too. Stay tuned!